This 3 bedroom property is nicely positioned towards the end of a row of mews style homes along this favoured part of the development which provides pleasant views towards West Nab to the front, and looking out over countryside beyond the rear garden. FULL DESCRIPTION This 3 bedroom property is nicely positioned towards the end of a row of mews style homes along this favoured part of the development which provides pleasant views towards West Nab to the front, and looking out over countryside beyond the rear garden. The immaculately presented accommodation is laid out over 3 levels and briefly comprises an entrance hall with cloaks cupboard, first floor landing with access to a w.c., a fabulous open plan lounge/diner open to the kitchen, and on the second floor you will find a master bedroom with en suite shower room, 2 further bedrooms, and bathroom. Externally there is undercroft parking for 2 vehicles, and access to a large and very useful store/Utility room. To the rear of the property there is a pleasant garden area with flagged patios, raised well stocked beds and adjoins common grassland with fields beyond. HALL With window to the side, a fitted cloaks cupboard, and staircase rising to the first floor. UTILITY/STORE 20' 6" x 5' 3" (6.25m x 1.6m) Utility/Store	20'6" x 5'3"
This is accessed through the undercroft. There is plumbing for a washing machine, and space for a tumble dryer beneath a work surface with wall mounted cupboard above. 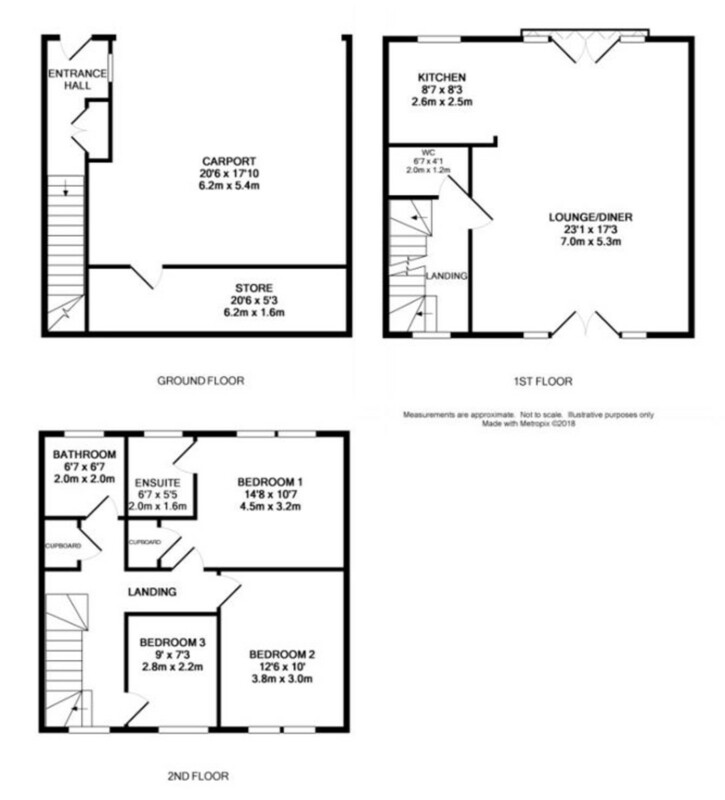 As the floor plan suggests, this is a sizeable room and provides good storage and has shelving and cupboards fitted at the opposite end of the room to the utility space. There is a tap so you can connect a hose if required. LANDING With window and views to the rear. CLOAKROOM 6' 7" x 4' 1" (2.01m x 1.24m) Fitted with a white suite comprising a low flush w.c. and pedestal wash basin with tiled splashback. There is tile effect flooring, and an extractor fan. KITCHEN 8' 7" x 8' 3" (2.62m x 2.51m) Nicely fitted with a range of wall, drawer and base units having work surfaces over incorporating a 1½ bowl stainless steel sink with mixer tap. Integrated appliances include a fridge/freezer, dishwasher, gas hob with stainless steel splashback and extractor hood over, and an electric oven & grill. The kitchen has a window to the front, and tiled floor. LANDING A 'T' shaped landing with window to the rear providing views over the garden, grassland and fields beyond. There is access to a very useful walk-in airing/storage cupboard which houses the Baxi boiler. MASTER BEDROOM 14' 8" x 10' 7" (4.47m x 3.23m) With windows to the front looking across the valley towards West Nab. There is a built in wardrobe/store. EN SUITE SHOWER ROOM 6' 7" x 5' 5" (2.01m x 1.65m) Fitted with a white suite comprising a low flush w.c., wash basin with cupboard beneath, and a large shower cubicle with mains shower over. There are tiled walls, tiled floor, ceiling spotlights, extractor fan, and a frosted window to the front. BEDROOM 2 12' 6" x 10' 0" (3.81m x 3.05m) Another double bedroom again enjoying delightful views to the rear. BEDROOM 3 9' 0" x 7' 3" (2.74m x 2.21m) A generous single bedroom with views to the rear. BATHROOM 6' 7" x 6' 7" (2.01m x 2.01m) Fitted with a white suite comprising a panelled bath with mixer tap and hand held shower attachment and screen over, pedestal wash basin, and a low flush w.c. There are tiled walls around the bath area and above the sink. The bathroom is then finished with tile effect flooring, ceiling spotlights, extractor fan, and a frosted window to the front. OUTSIDE There is access at the front of the house to undercroft parking for 2 cars which leads on to the utility/store room. The rear garden is very pleasant with raised well stocked beds, and flagged and pebbled sitting areas, all enclosed by stone walling. LOCATION From the centre of Meltham, proceed down Station Street, pass Morrisons on the right, and continue up Slaithwaite Road turning left onto Red Lane just after the car sales centre. Follow the road for a while before turning left down Sunny Bank Road. The property will be found towards the end of the next right turn.